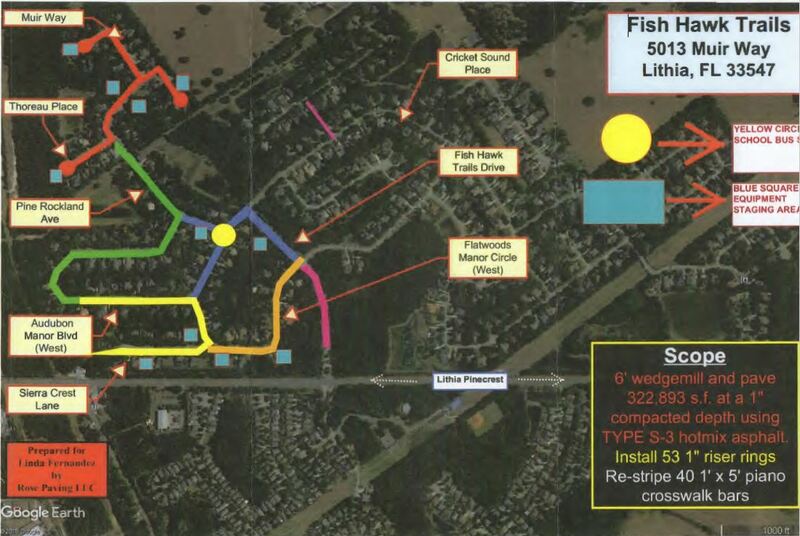 In December 2018 you were notified that Phase I of the roads would be scheduled for repaving. The roads on your streets are scheduled to paved 15 APRIL 2019 and it is estimated the project will be completed by 22 APRIL 2019 barring any rain delays. Paving will occur in your colored section on the scheduled date and no vehicular access to driveways will be allowed from 7:00 am to 7:00 pm. Residents are required to park outside of the impacted area until the barricades have been removed. This will require foot traffic to and from homes. You are welcome to park on a non-affected section area overnight. Your safety and our contractor’s safety are of utmost importance to your Board and the contractor. Please observe and obey all traffic control procedures, speed limits, and do not move or cross over any barricades as this can result in damage to your vehicle, the new asphalt product and adjacent drives. Please be aware that the product we are applying will cause permanent damage to your shoes and clothes if not properly cured. Please know that any cost related to repair and/or clean-up of this damage will be the responsibility of the offender. Please be aware if an unforeseeable condition like rain occurs during your scheduled day for asphalt paving, the new date will be posted on the traffic/barricade signs and on the website. Please reference your community website at https://fishhawktrails.com for updates and schedule modifications. We sincerely appreciate your patience and cooperation during this project. If you have any questions or special needs issues relating to this project, please contact Scott Metheny at email. The preferred method of contact is by email at scottm1861@gmail.com.